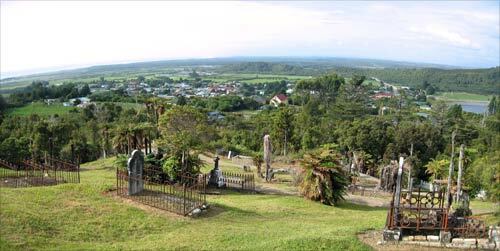 This historic cemetery, on a hillside overlooking the town of Ross, is a peaceful place. Some of the older graves date back to gold-rush days in the 1860s and 1870s. Siting a cemetery on a hillside is inconvenient for holding funerals, and digging graves can be difficult, but it is likely that there was no flat land available during the gold rush, when every patch was pegged out by prospectors.